The Motivate Football Academy Sierra Leone (MFA) continued their search for young footballers under the age of 14 and 17 with a two days trials, on 19 to 20 January 2019 at Angola Townfield, Goderich. The said event attracted lot of young football talents and according to the Academy head coach, Abdul Mansaray the trials at Angola Townfield is just the beginning of their search as a similar event will be hosted at Approved school in Wellington on 26th January and at the Sierra Leone Football Association (SLFA) academy ground, Kingtom on the 2-3 February 2019. 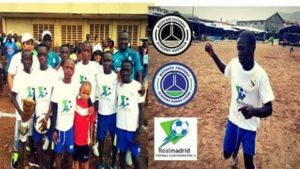 For the Academy’s General Manager, Ibrahim Conteh, they are going to offer football courses for children and youth as well as courses from grassroots, Class ’C’ and Class ’B’ in collaboration with the Sierra Leone Football Association (SLFA) and their International partners from Brazil, Spain, Australia and England. “This academy will provide sustainable ways of transforming football (soccer) in Sierra Leone,” Conteh said and promised that unlike other football academies, who have operated in the country, they are going to ensure it sustainable and their activities would be a continuous process in identifying, training and building footballers to participate in national and international competitions, which are income generating.